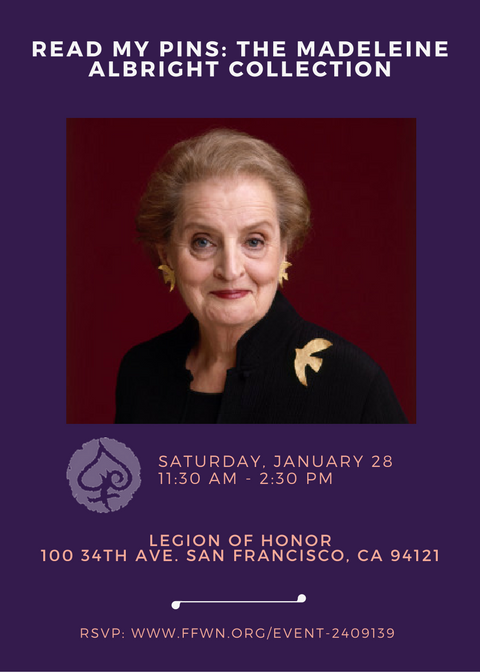 Grants full-access admission to Legion of Honor Exhibitions including Madeleine Albright's "Read My Pins"
Enjoy full-access to all exhibitions at San Francisco's beautiful Legion of Honor and bond over lunch at the Legion of Honor Café. Read My Pins presents a remarkable range of more than 200 pins and brooches from the personal collection of Madeleine Albright. The majority of these pieces were collected and worn during Albright’s service as US Ambassador to the United Nations (1993–1997) and as the first female Secretary of State (1997–2001), under President Bill Clinton. The assortment is eclectic, international, and representative of nearly a century of jewelry design. Yet the jewelry’s true interest lies not in their materials or monetary value but in the roles they played during her political service: Albright used her pins as silent yet visually outspoken codes to foreign officials and the press. Pins could be adopted for various reasons—a shining sun or a patriotic flag would reinforce a positive alliance with the United States, for example, while more difficult negotiations might bring out wasps or snakes. Madeleine Albright served the US government during a remarkable period in history, and many of the notable landmarks of her tenure can be decoded through the visual iconography of her pins. These pieces document and symbolize moments of political upheaval and also convey the patriotism of this Czechoslovakian-born diplomat. Whereas George H. W. Bush famously said “Read my lips” to convey a campaign promise, Albright encouraged, “Read my pins,” demonstrating that jewelry had become part of her personal diplomatic arsenal. These objects became delicate instruments with which she applied pressure during intense negotiations, and into which she invested humor as she represented the United States on the international stage. If you're bringing a guest, make sure that she's someone who doesn't take herself seriously, laughs a lot, willing to share her expertise, pay forward and femtor next generation Filipina women and will join FWN. In other words, an awesome Filipina like YOU. Meet other like-minded, socially, economically and politically engaged Pinay sisters for lunch, networking and collaborating.